Co-ops may be among the shortest-lived phenomena on Vermont’s protean art scene. It’s hard enough for a single proprietor to sustain a gallery or a rental studio in a state with plenty of starving artists but few art fat cats. Toss in the elements of eccentric personalities and collective decision making, and the lifespan of an art co-op in Vermont is likely to be briefer than the Calvin Klein undies Mark Wahlberg used to model. 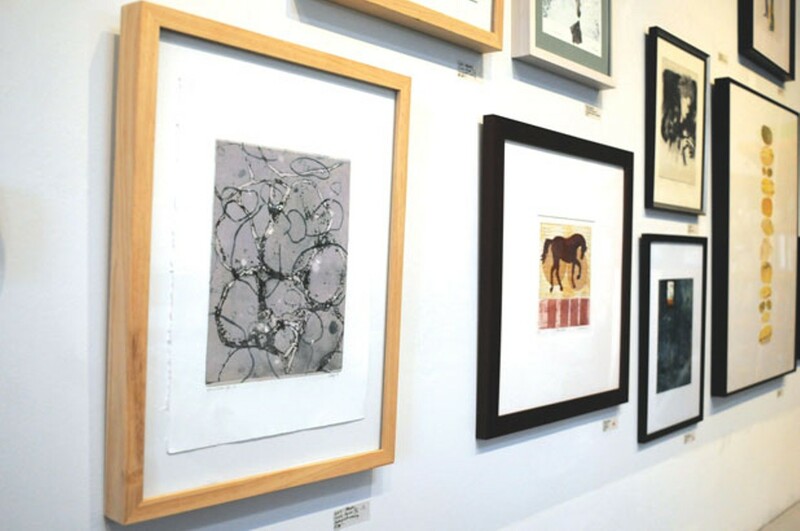 All the more remarkable, then, is Two Rivers Printmaking Studio in White River Junction: It’s been succeeding as a cooperative since 2001. 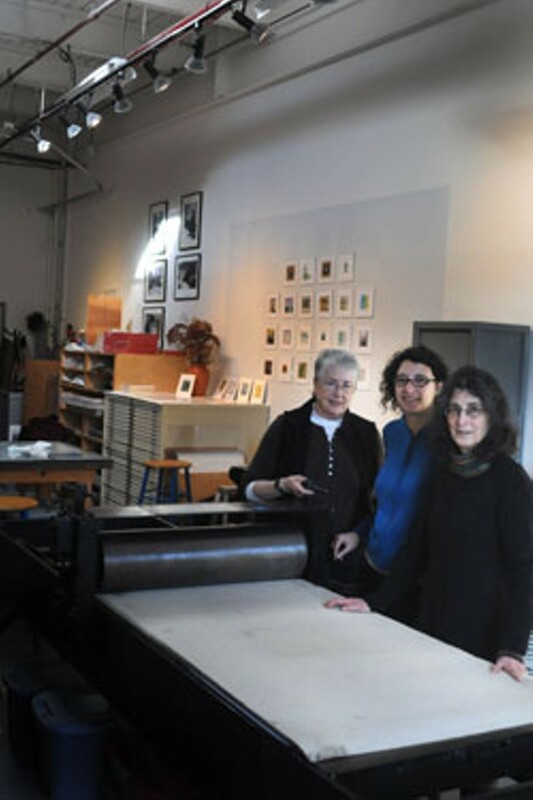 The studio clearly fills a need in the Upper Valley for a space where printmakers can get access to excellent — and expensive — equipment. Initiates will appreciate that Two Rivers owns a William Crull etching press, a Conrad E18 etching press and a 30-by-60-inch Takach press. Two Rivers also offers workshops where newbies can learn about a multiform medium’s technical complexities. These regular sessions, which also cater to semi-experienced printmakers, enable the in-house artists/teachers to interact with outsiders, some of whom may eventually become co-op members themselves. The quality of the works created by the studio’s denizens serves as a convincing advertisement for Two Rivers. 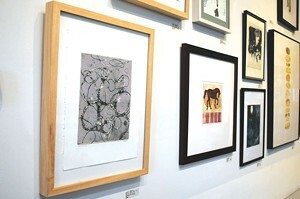 Prints by several of the co-op’s 20 members are currently mounted on the walls for a holiday show that will remain on view until the end of this month. Some standouts include Lynn Barton’s luminous landscapes, Lois Beatty’s layered swirls and splotches, and geometric abstractions by Rachel Gross. Case in point: Some of Elizabeth Mayor’s woodcuts resemble African shields or switchbacks on hiking trails, even though the Hanover, N.H., artist is more a formalist than a realist. That commonality may reflect what Beatty cites as one of the potential dangers of creating art in a co-op setting. “Artists who work together a lot can make pieces that start to look like one another’s work,” she notes. The studio can get busy at prime times — Saturday afternoons, for example — although there’s a sign-up calendar intended to prevent crowding. At other times, such as during a visit just after Christmas, the kempt and airy 1000-square-foot space is tranquil, and feels homey despite the presence of sizable machinery. Two Rivers functions mainly as an art-production facility, but it doubles as a gallery where visitors can buy what they see on the walls or in a bin of small prints that go for a mere $40 apiece. Browsers can also select images from a portfolio of members’ work that a Two Rivers committee compiles every three years. Revenues come mostly from members’ dues, pegged at $125 a month or $900 a year. Nonmembers can use the studio’s machines and instruments for $25 an hour. The workshops bring in needed funds, as well. Two Rivers is situated on North Main Street in the Tip Top building, which once housed a bread bakery and related offices. The handsomely renovated interior, which includes more than 30 workshops and small businesses, reflects downtown White River’s transformation from seedy to chic. The printmaking studio’s cohorts in this creative-economy upswing include the Center for Cartoon Studies, cofounded by Gross’ husband, James Sturm; Northern Stage, home to one of Vermont’s finest theatrical companies; the quirky-arty Main Street Museum; Revolution, a women’s clothing boutique that features the creations of Vermont designers; a fine-dining restaurant; and, of course, the requisite coffee house — Tuckerbox. Artsy gentrification has clearly rolled into the old railroad town, through which trains still run. But, to Beatty, who has lived in the area for several years, “it doesn’t feel as though you’re coming in and pushing out the indigenous people,” she says.